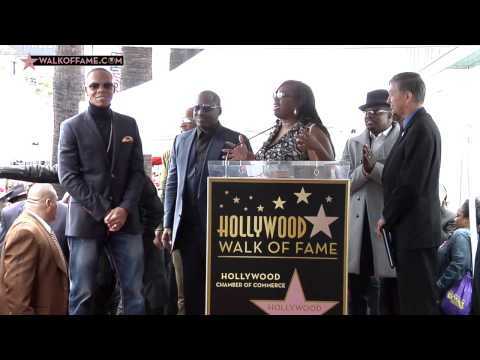 The Hollywood Chamber of Commerce proudly honored musical group New Edition: Ronnie DeVoe, Ricky Bell, Michael Bivins, Bobby Brown, Ralph Tresvant and Johnny Gill with the 2,600th star on the Hollywood Walk of Fame on Monday, January 23rd at 11:30 a.m. PST. The star in the category of Recording was dedicated at 7080 Hollywood Boulevard next to the stars of fellow Boy Band Groups Boyz II Men, Backstreet Boys and New Kids on the Block. Helping Emcee and Hollywood Chamber President/CEO Leron Gubler to unveil the star Jimmy Jam Harris and Terry Lewis, Stephen Hill and Jammie Adams. “Ever since fans found out that New Edition was being honored with a Walk of Fame star, it has been non-stop inquiries about when the group was going to be honored. Well, the time has come and fans from around the world have booked their flights and are on their way to Hollywood to celebrate this momentous occasion,” stated Ana Martinez, Producer of the Walk of Fame ceremonies. For more than 30 years, New Edition has mesmerized audiences with their signature choreographed shows, smooth vocal harmonies and electrifying showmanship cementing their place in history as one of the most successful touring groups ever. Boasting music’s most loyal audience, 15 national tours, 18 multi-platinum albums, 4 American Music Awards, 14 No. 1 records and countless Billboard Top 20 hits, New Edition remains the unstoppable measurement of true R&B, Hip-Hop and Pop music. The New Edition phenomenon was born in 1983 in Boston, MA with teenagers Ronnie DeVoe, Bobby Brown, Ricky Bell, Michael Bivins, and Ralph Tresvant. In 1986, Bobby Brown left the group to begin a highly-charged solo career – soon after solo artist Johnny Gill joined the band. New Edition evolved stronger than ever with “Heartbreak,” their biggest selling album with three No. 1 songs. The amazing success has proved fruitful for the brand. In 1989, New Edition orchestrated one of music’s biggest coups by simultaneously launching Ralph Tresvant and Johnny Gill’s solo albums, while Ricky Bell, Michael Bivins and Ronnie DeVoe created a high-octane group and new sound with Bell-Biv-DeVoe, which spawned the 4-times platinum cross- over hit “Poison”. Between the various projects, a cumulative 30-million records were sold and altogether, the men dominated Billboard charts, MTV, VH-1, BET and stadiums across the country. New Edition laid the foundation for how modern-day boy bands look, feel, and sound. Boyz II Men, N’SYNC, The Backstreet Boys, and New Kids On The Block all took their cues from Ronnie DeVoe, Ralph Tresvant, Michael Bivins, Bobby Brown, Ricky Bell & Johnny Gill. After 30 years of breaking hearts on the record and from the stage, New Edition finally gets the biopic that their stellar tenure in entertainment so richly deserves. This epic three-part miniseries follows the group from their humble beginnings as kids in Boston to global mega-stardom - weathering the highs and lows of controversy, personnel changes, and the ultimate cost of fame. THE NEW EDITION STORY includes a collective of award-winning producers and directors including iconic music powerhouses James “Jimmy Jam” Harris, Terry Lewis and Kenny “Babyface” Edmonds, Executive Producer Jesse Collins and award-winning director Chris Robinson. THE NEW EDITION STORY will air as a six hour, three night event on January 24, 25, and 26, 2017 at 9 PM ET/PT on BET. New Edition is officially a movement that turns the band into an R&B mega-group with its dynamic, razor sharp choreography and larger-than-life on-stage persona which remain undeniable wow-factor that continue to fascinate audiences all over the world.